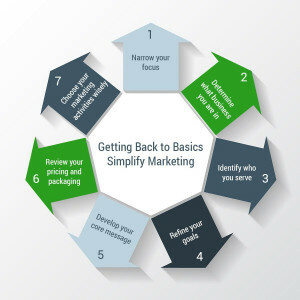 Whether you are a new business or one that’s been around for a while, it is a good idea to get back to marketing basics to help you make intelligent decisions on where you should spend your time and resources. Are you trying to be too many things to too many people? Do people know exactly what you do and how you benefit them? The first step to simplify marketing is to narrow your focus by picking a niche within your industry sector. The more focused you are, the more likely your business will be visible, not only to those you are purposely targeting, but to others that may feel your services will help them solve their challenges as well. Service businesses such as marketing, business coaching, construction, IT, home improvement, legal or financial services benefit from creating a niche that you can dominate and become known as the expert. Why? Being too broad makes it difficult to find a viable target audience and craft messages that resonate with that audience. It is much easier to explain what you do and why to a group of people with a specific need. Why did you start your business in the first place? What value do you provide your ideal clients? What business you are in is not about the products or services you sell. The business you are in is more about the experience you create and the result of your efforts. Think about your business from the perspective of what you enjoy offering your clients and how you add value to them. Are you in a life coach or do you help people overcome personal obstacles to success? Are you a hairdresser or dentist or do you help people gain more self-esteem? Are you an organizer or do you help simplify the lives of your clients so they have more time to enjoy each day with less stress? Determine what your business really sells, the experience you create and the value that your customers get from your products or services, and you have your foundation for your marketing plan. Do you enjoy working with your current clients? Is there a group that would better appreciate what you do and make your passion come alive? When you speak precisely to your target audience, you simplify marketing because you are extremely clear about the value you offer and why your ideal clients should work with you. This clarity attracts the right audience, which empowers you to turn away those clients that drain you of energy. Knowing exactly what your ideal client wants or needs and how to best reach them makes your marketing more effective and saves you money by not wasting it on activities that don’t make sense for your business and the clients you serve. 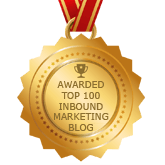 Are your marketing goals still realistic and achievable? Have you written goals that are specific, quantifiable and aligned with your business purpose? It’s easy to lose sight of your goals when things get hectic. Setting realistic and measurable goals helps you focus on efforts that produce the results you want, eliminating activities that waste time or direct your attention elsewhere. Goals also help you make decisions about whether to spend resources on a marketing activity. If the activity doesn’t get you closer to your goal, look spend time elsewhere that does. Do you have difficulty with answering the question “what do you do”? Can you tell people what you do and why they should with you? Once you know what makes you different, incorporate it into your core message about the benefits of working with you. A captivating core message speaks directly to the needs of your ideal client, allowing you to connect with them. Your core message is a short description of your business that enables prospective buyers to know who you work with and what value you bring to the relationship. It conveys this message in a manner that literally attracts the right customers to you. A good core message projects what makes you unique and a benefit to your ideal client. Your core message creates credibility and relevance for your ideal client, explaining how you help your ideal client, the value they will receive and the end benefit to their business. Your prospects do not care what you do or how you do it. They care about what you can do for them. They will be interested in you if you can solve a problem, improve a process, increase sales, cut costs, find new clients or open new markets. Is what you sell in line with what your audience wants to buy? 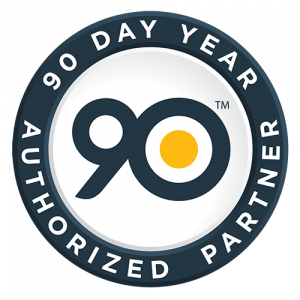 Do you make it easy to do business with you? Pricing and packaging is an important aspect of marketing that needs to be carefully planned and executed. The tradeoff between what you charge for a service and what your ideal client thinks it is worth is a careful balancing act. As a service business, people pay you for what you know and how you apply what you know to solve their problems. How your ideal clients perceive the value of your services is a critical component to being paid what you are worth. Are you offering the correct services that appeal to your ideal client? Are they packaged so they are easy to understand the value being offered? Are they value priced so that you get more money for your time but your ideal client feels good about the value these services provide? Be unique and offer your services in a way that makes you stand out from your competition to make your business memorable and credible. You want a prospect to be able to quickly and easily understand what you do and what sets you apart from your competitors. Have you started too many activities and not seen results? Are you spreading your resources too thin? Now that you understand the market you are targeting, you can begin to select the marketing activities that will help you achieve your goals. Not all marketing strategies will reach your ideal client so be sure to align them with your industry, ideal client and goals. Spending time on a social media campaign may drive visibility, but if it doesn’t drive your business success and help you achieve your goals, it is a wasted effort. With all the hype around digital marketing and social media, business owners forget that online is simply a new channel that helps you reach your ideal client. Before you can get the digital channel, or any marketing channel to work for your business, you need to get back to marketing basics. Really Great Post. Helpful information. Marketing is very essential for business. Thanks for this great article, It’s very useful for readers. Marketing is changing so fast, it’s easy to get our heads turned by new, high-tech developments and this article is a great hint to start basics as sometimes we need reminders of ultimate importance to help clarify our focus.